For the circle challenge was to create something for your car. So I created something very useful, this is a pocket organizer to hold your registration, insurance card and any other pertinent information you need at a moments notice. 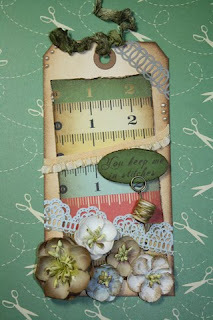 I used the Street Sign cartridge for the cuts, twine from the Twinery and 2 different stamps by Pink by Design. I have two winners to announce! They will each recieve a handmade bughead made by me! already a follower.. i would love to win! She is adorable! You could sell this design to a tattoo artist! Hi Everyone thanks for hopping with us! If you just came from Pammejo then you are in the right place !!! If not you can start at the beginning with ABBY !!! Its all about the beach today so I made a card with a Greeting Farm Stamp "Siren", I also used Spellbinders, a punch, Honeydew twine, button and added glitter to the eyeshadow and around the white cut out of the Stamp. The background paper has glitter also on the waves/swirls ! Hope you enjoyed! If you will become a follower and leave a comment I will put your name in the drawing for a handmade vinyl bug head for your car or machine! Your next stop is............Meighen !!!! I really wanted to use my NEW cartridge Sweet Shop ! I used a Pink by Design stamp from " Tags and Treats", The paper is from the Sweet stack of DCWV, Bazzill ric rac ribbon, and of course some twine and a cute button! Are you wondering how I got these Strawberries so yummy and realistic??? I used a fine tip black marker to add the "seeds" then used a white and brown gel pen to create the chocolate "drizzle". I waited for it to dry before applying "glossy accents" to the chocolate part of the berry. This gives it a glossy look! My daughter wanted butterflys in her room, so while I was in Texas I found these adorable butterflys at Hobby Lobby to hang from the ceiling and on the wall. Thank the Troops Blog Hop !!!! HI Everyone thanks for hopping over!! If you just hopped from Haidee then your in the right place. If you need to start at the beginning click HERE. I created a card a soldier could send to another hurt soldier or someones family. Those seem to be the hardest cards for people to make and give. I used Stand & Salute for the medal and Gypsy Wanderings for the heart. I had to change some of the cut lines in my gypsy to create the purple heart medal. I also used a Pink by Design stamp from "Our Heros", a SU punch, and a star punch for the top of the flag. I wanted something simple looking but powerful at the same time. Thanks to all the troops past and present for their service in protecting our Freedom !!! ** Blog Candy** If you'd like to become a follower and leave a comment I will draw a winner for a handmade vinyl bug head of your choice from the colors I have (made by me) to put on your car or machine !!!! Thanks so much for stopping by !!! Your next stop on the hop is Kari !!! I used Nifty Fifties Cricut cartridge and a Pink by Design stamp from "Woodland Critters"
I created this Vintage type tag and in the video I show you a few techniques and some cool products. All these products went perfect with my Pink by Design "Material Girl" set !! and the video...... Im in LOVE with this new product !! Thanks for stopping by !! HI Y'all !!! Yep I'm back from Texas! I'm sure you saw my 3 haul videos I bought and went crazy in Texas...you know the saying "Go BIG or Go home" right? Well if you haven't got a chance to view all my awesome deals feel free to scroll down a few posts ! She (Stefani) was waiting at the airport holding a big ol sign saying "MICHELLE"..lol yes I was a little embarrassed but it was funny. Let me tell you my stay at her home was WONDERFUL I had my own bedroom (in the craft room) hehehe (my fav place to be) each night I would come back from shopping and find crafty treats on my pillow ! What girl wouldn't be in Heaven?? lol Both her and her hubby were very sweet and accommodating. She also gave me a BEAUTIFUL gift for my birthday!!! She handmade this reversible bag with my initial and used the E2 to cut the monogram. AND you know what else??? The pink Journey cartridge !!! OMG I couldn't believe it!! Her blog is Styles by Stefani check her out and tell her I said HI!!! So I wanted to say THANKS to her a her hubby for letting me stay in there home, taking me places, carrying my heavy bags to the airport (filled with ALL my treasures!) !!! I had a great time !!!! What an Exciting Day !!! I recently submitted some craft projects I have done to the Cricut Magazine. Since I had never done anything like that before I really didn't expect a response. But I'm excited to tell you they picked all 3 of my projects! I am through the roof excited, I will be in print !!!! Whoo HOO !!! Just a tip for anyone thinking of doing this, Write ALL your measurements down...LOL It will save you alot of time. I spent most of the day figuring out brand names, sizes and exact how to of each project. Final haul from Texas Y'all! Here is a video of my last day at GASC on Friday and my final day of shopping with Stefani today at Hobby Lobby and some local scrapbook stores in Texas. I'm working on packing everything to hit the airport in the morning....hope I don't have to buy an extra ticket. I don't know if you can hear me on this video...if not please ask any questions you have. I posted the projects I learned in a few classes and when I get them a little more down, I'll post videos on how to do them, too. Hey Y'all! Yep I'm a Texan now!!!! Well at least until Sunday or until all the great deals dry up! I'm in Texas attending GASC with my Top Stalker, Stefani. Guess I'll have to call her something else now....she is real! Here is my second video....It is the haul I scored with 9 funfilled hours of shopping at the Great American Scrapbook Convention in Arlington, Texas!!! Amazing deals! I hope you enjoyed these!! I enjoyed making the score! Its that time again Pink by Design will be releasing new stamps this friday June 3rd !!! So I wanted to give you a sneek peak of a couple of the stamp sets you will see!! !